Communique: Inshiradu Receives Support From Cucalorus For 1898 Narrative: "What The River Knows"
Alicia Inshiradu has been working on a film for 18 years: What the River Knows. 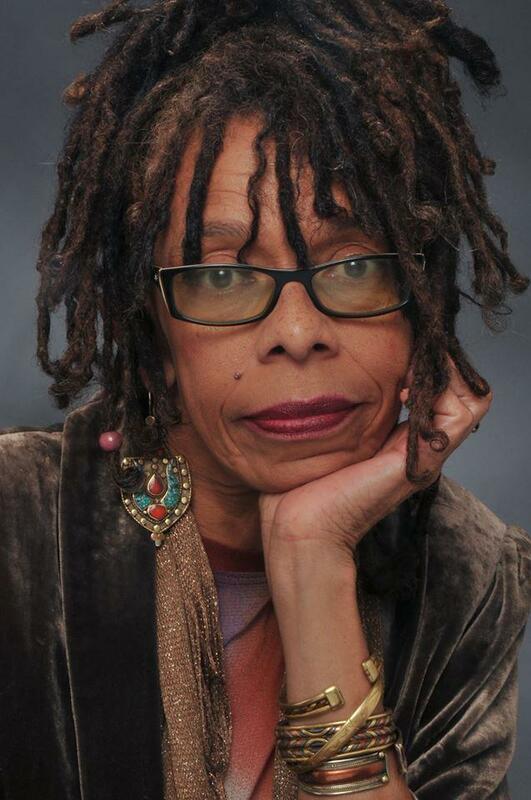 This year, Alicia received a grant to produce an excerpt of the work. It's a historical narrative-and a ghost story-inspired by the 1898 coup d'etat in Wilmington, North Carolina. Listen to Alicia talk about the film above; find details about the fundraiser, and an extended conversation, below. The fundraising goal for this film is $9,818. As of this writing, a little over a third has been raised; the Indiegogo campaign ends on September 16. Gina: How did you get into making films? Just in terms of your background in this field. Alicia: After graduate school at ECU I knew I wanted to make a movie before I died. And so I heard that a creative writing program was opening up in Wilmington, North Carolina. This was 1996 and the graduate creative writing program was opening up and I thought, that's a film capital. So I got into the creative writing department at UNCW. I began in January 1997. Gina: And this is not your first film. Alicia: This is not my first film. I made “Blind Date” which is a seven and a half minute short film that is exactly one hundred worth of dialogue. No more, no less. It was made for the 100 Words Film Festival in Charlotte. So we did premier “Blind Date” at the 100 Words Film Festival in Charlotte back in early November. Then we took it to Cucalorus a couple of weeks later, and we took it to the North Carolina Black Film Festival. And it's been in the Wilm Film Chick Flicks Film Festival here also. Gina: Is that available online? Alicia: It is. It's on YouTube and it's on our Indiegogo site. 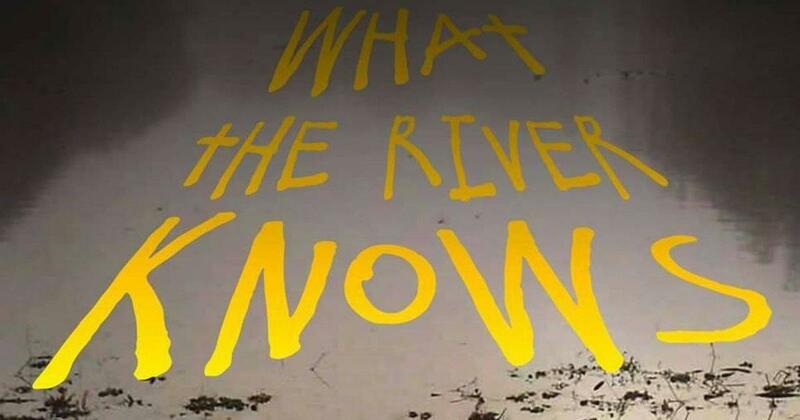 Gina: Now this movie though that you're working on right now is called What the River Knows and it is based on a historical situation here in Wilmington, right? Alicia: Yes it is inspired by the event that happened here in November of 1898. Gina: Tell me. Tell me the story in the movie and it is it fact based? Alicia: My screenplay is a narrative drama. It's a ghost story slash murder mystery and it is inspired by the 1898 event. However, it is set in both 1898 and 1998. Gina: What about the events of 1898 roused your creativity for this ghost story? Alicia: When I was in grad school I went to see “Rosewood” and a very serious event happened similar to what happened here in 1898 happened in Rosewood, Florida where there was a very thriving community of both blacks and whites. And within a week it had been burned to the ground. It was a fictional narrative drama called “Rosewood” And I was so utterly shaken and impacted by that movie that I decided to research what happened here in my new home town of Wilmington, North Carolina. I wanted to know what happened in 1898 so I started doing research. And I knew I wanted to write a screenplay. A visiting professor came to UNCW and he taught me screenwriting and within nine months I had a storyline I wanted to do. I wanted to show a fictional family and what they went through. Or how the event affected them. I was looking in a JL Hill business directory of 1897 as I was doing my research and I was looking at all of the businesses with asterisks. Those were the “colored” businesses and there were many. And I saw an ad for a city sign painting shop and a bill poster. 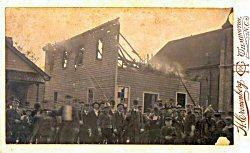 And it was a shop that belonged to a colored man by the name of Balaam Fuller. He was the only city sign painter and bill poster in town at the time. And I said, wow interesting. Gina: So this directory that you found was a real directory? Alicia: Yes, the JL Hill a directory for 1897 is the one that I found at the North Carolina Room. So all of my characters are fictional. I have created all of these characters except for two historical characters in the film-Alex Manley who was the publisher and editor of the Wilmington Record. 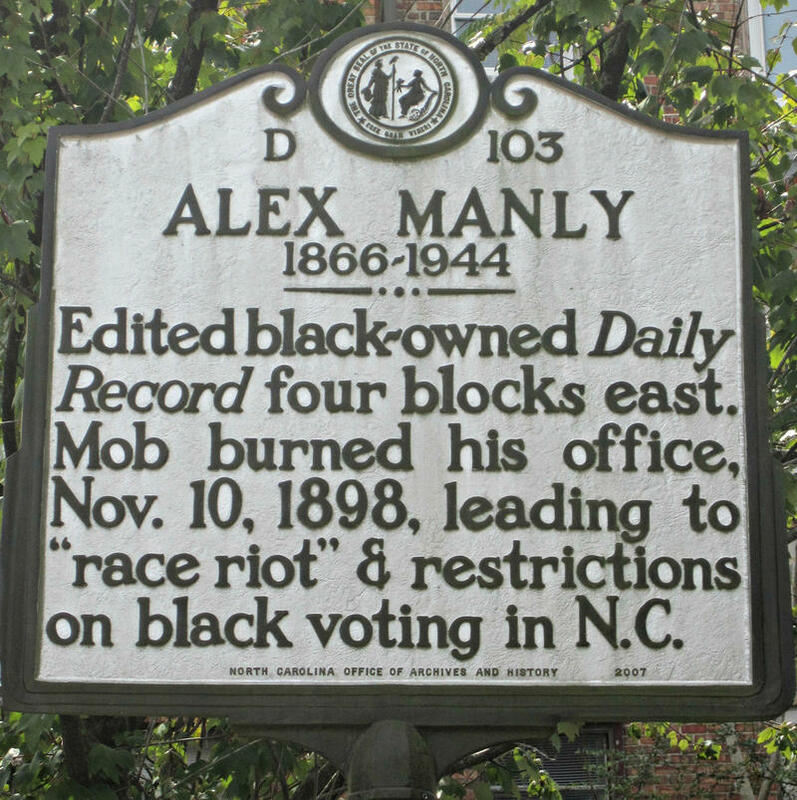 At that time the Wilmington Record was the only daily black newspaper in the nation. Gina: Can you can you sum up the film? Alicia: A young man returns to his hometown of Wilmington, North Carolina to bury his grandmother and he gets captured by the ghost of his great great grandfather who is also his namesake, and his great great grandfather takes him back to the last six months of his and his wife Kitty's lives from May 30th, 1898 to November 10th, 1898. We come back to 1998 in which the young Baley learns about his ancestors, he learns about his history and he's determined to not only give his great great grandfather a proper burial, he also wants to include the whole city in the memorial too, as a redemptive kind of service and a service of reconciliation for all of the losses that have not been acknowledged. Gina: This is a full length film? Alicia: Yes. I have written a 120 word of feature script that I wrote 18 years ago. I defended it as my master's thesis at ECU after actually writing it at UNCW's graduate program and I had been rewriting it actually for 18 years because I'd been trying to sell it to Hollywood. But what I'm doing is, because I received a Cucalorus grant this year, I have excerpted the story to create a short teaser film with a cliffhanger ending and the goal of this production is to create a film industry standard film that will attract investors for the future. Gina: You've been working on this for 18 years? Alicia: I have been working on this for 18 years, Gina. Yes I have. Gina: How are you funding this right now? Alicia: Because it is an independent short film and because I haven't monetized it, I have had to do a fundraiser because I have a crew and cast of over 30 and I am determined to compensate all of my crew and cast monetarily for coming on and working with me and helping me to make this film. We have an Indiegogo campaign going on. It's called What the River Knows and it's at Indiegogo.com. And so the goal is $9818. I transposed the numbers of 1898. And it will take close to ten thousand dollars to make this into the quality film that that I want it to be. And so we're very thankful to Dram Tree Shakespeare for that. And we also are running sponsorships to help us because it will take close to $10,000 to do this film. As I said, it's an independent film and it's not monetized in any other way. And so we are dependent on the fund raising. So we're, we're moving along with the Indiegogo campaign doing well, we have 10 days left. You can go to indigogo.com to What the River Knows and donate anywhere from $5 up to $1,898. You can have an executive producer credit for $1,898 but there are several levels in between. And we're offering some exciting film related perks for donors. I think that it's time to share a narrative drama about the event. I think that's just going to be a really good way of people becoming informed and educated about it and they may be inspired to read up more about the 1898 event and to get a better sense of it. To be able to understand what happened so that it won't happen again possibly. Hopefully. Communique production assistance from Lindsay Wright. Transcription assistance from PopUpArchive. As February is Black History Month, we turn our attention to the 1898 coup d’état in Wilmington. WHQR spoke with Philip Gerard, author of Cape Fear Rising. CoastLine: Do We Still Need Black History Month? This broadcast of CoastLine originally aired on February 18, 2015. It’s February. And that means that it’s Black History Month. On this edition of CoastLine, we examine how we're handling this month in 21st century North Carolina and why the discussion of African history is inextricably intertwined with the contemporary issues of race with which we grapple today.